There are a number of things that happen behind the scenes before an adventure module hits your hands. Publishing a module, and hammering out an adventure for your friends in a notebook are two completely different things. It also takes more time than one might expect. The expense of having 100 or even 50 short modules printed alone can put a large dent in the budget. I quit a cushy office job to take on this endeavor of a dream. A dream to not only be an RPG illustrator, but a producer of adventures and tabletop products. So far, things are going pretty well, and my work has now been distributed around the planet. That doesn’t mean wealth, it means getting by while building a dream. You can help build this dream AND get some pretty groovy collectible items along the way. Items that grow in value as my dream and career grow. Items like the Kobold Throne below. 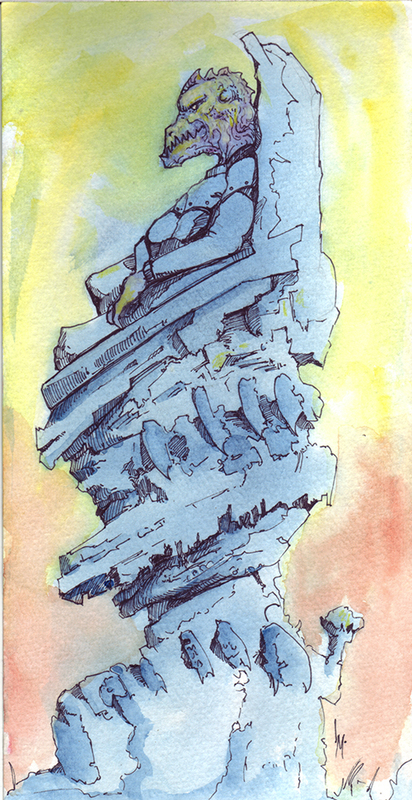 Kobold Throne 6″ x11.75″ water color with ink pen on heavy stock watercolor paperboard. Interested in getting original works like this at a bargain? You can. You can also get a stream of RPG content, items, NPCs, art and ideas to bring to your gaming table for just a little scratch every month. Check out the Patreon page to learn more. I am choosing Patreon primarily because it has a ‘members only’ board. This allows an inside view of the work that an artist invests in creating that ‘cool looking orc’ on the cover. Patrons provide on-going support to create RPG content for their games. Here I can post weekly updates of items, new characters or artwork. Patrons get content before it goes to print. Dibs on art, and after it does go to print, your support gets you either free copies or ‘at cost’ signed copies. Next, you simply need to choose your support level and watch the feed! If this project produces results and artwork that satisfies everyone, I would like to continue this journey. This is the first step. Funds raised support my work and life as an artist. They also afford me the ability to print, produce, and take on the costs of production. If the project funds significantly there will be more rewards and funding will be folded forward to more projects. Sharing the page and the project will only grow your own rewards.